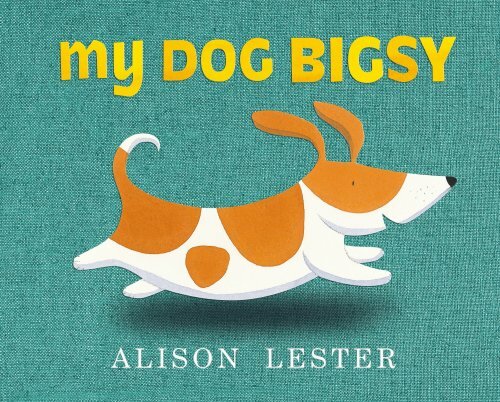 My Dog Bigsy follows an energetic dog who runs around the farm visiting all the farm animals. The animals make lots of noise. Squawk, neigh, quack, moo, baa, oink, cluck, purr, ruff ruff ruff! And it's all because of Bigsy! This simple story is great fun to read. Children love joining in and copying all the animal sounds heard throughout the book. The endpapers show a map of the farm, which children can explore while imitating the noises of animals found on it. What makes this book particularly unique, is the wonderful introduction of Bigsy showing a very detailed description of him with arrows pointing out the special features. In this description, we see that Bigsy has crooked front legs, a long body and five brown patches (one shaped like Tasmania). In addition to copying sounds and description, My Dog Bigsy can be used to target concepts of time (morning/night) and location (over, down, into).